Security and automation work hand in hand, and complement each other for critical sites such as infrastructure facilities, airports, and public buildings. HTS Vehicle Recognition Systems (VRS) are installed at the main entrance to many Critical Facilities and can be fine-tuned to specific use cases anywhere in the world. The VRS systems read license plates, along with car make and model, and interface with security forces, or other data bases in real time creating alerts for suspicious or other problematic vehicles. HTS has specific competencies and capabilities in the homeland and general security sector both for security and logistics. 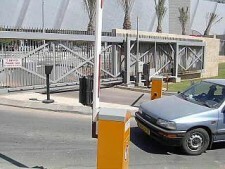 HTS’s Critical Asset Protection Systems screen every car arriving at the entry and exit gates to a facility. The system can interact with security services databases in real time – checking each license plate and vehicle for potential security problems.